the video commercial shown here. This "video" is not speculation. I first encountered the Obama Death Board on Aug. 30, 2009, a full half year before Obamacare was enacted. It was buried in the American Recovery and Reinvestment Act of 2009the Obama stimulus bill. It was adroitly concealed under the boring name of the Federal Coordinating Council for Comparative Research (yawn). The bill said its mandate was to "...assist the agencies of the federal government including HHS and the Dept. of Veterans Affairs...to coordinate comparative effectiveness and related health services research...The Council will consider the needs of the population served by federal programs." (yawn) In reality, the sole job of the Federal Coordinating Council, whose members were quickly selected by Barack Obama within a week of the law passing was to create the formula for rationing healthcare to seniors and to other Social Security recipients who were disabled and, like the elderly, were deemed to be "double-dippers"receiving Social Security benefits and were on Medicare. On March 21, 2011, I found a video recorded on Oct. 13, 2010, less than 3 weeks before the 2010 Midterm Election that was made by Dr. David Janda concerning the rationing that was going to take place beginning on Jan. 1, 2013. Dr. Janda first addressed the Obamacare warning as the keynote speaker at a congressional dinner in the Capitol building on July 17, 2010. He began his speech by saying, "It should be clear that the same warning notice must be placed on the Obamacare Plan as on a pack of cigarettes: consuming this product will be hazardous to your health." (No yawns here.) "The underlying method of cutting costs throughout the plan is based on rationing and denying care. There is no focus on preventative health care needs whatsoever. The plan's method is the most inhumane and unethical approach to cutting costs I can imagine as a physician." Click on this sentence to visit Dr. Janda's March 21, 2011 political rally speech. In the speech, he reiterates that a National Coordinator for Health Information Technology will ultimately be responsible for implementing the guidelines created by the the Federal Coordinating Council. The National Coordinator (or those working for him) will "...determine treatment at the time and place of care." That means, Dr. Janda said, "...when your physician walks into your hospital room, his nurse or physician's assistant [PA] will be carrying a small hand-held computer. As the doctor verbally tells you his prognosis, she will be typing that data into the computer..." and while the doctor chit-chats with you, someone at the other end of that computer terminal is deciding whether you live or die based not on your medical needs, but rather, if its profitable for the government to let you continue to live by gauging the cost of the procedure (and the other monetary factors in the Social Security database) with your life expectancy combined with your economic value to the community-at-large. Once you pass 75, unless you're a politician, a relative of a politician or a major political donor (a rich guy), with rare exceptions, you will have virtually no economic value to community, and you will be denied medical care. In some cases, if expensive medications are the only thing keeping you alive, you may find youself on an aspirin regime instead. The core objective of the Death Board is not to save the patientit's to save government by curbing the number of people who outlive the actuarial mortality tables, and who continues to receive retirement income benefits their government believes they don't deserve because the actuarial statistics from which those benefits were computed, predicted they should be dead by now. Until Obamacare, America was the only nation smart enough to avoid the legal euthanasia devise of government. Obamacare is Barack Obama's, Nancy Pelosi's, Harry Reid'sand the 2007-11 Democratic super majority'stoxic program to correct the national mortality rate in order to save Social Security. You can't convince me that the Democrats (the only ones with full access to the text of the Patient Protection and Affordable Care Act of 2010) didn't know that Obamacare, which guarantees people with preexisting conditions health coverage, would also ration healthcare to the elderly, and deny lifesaving procedures and medications to those the social progressives viewed as a financial drain on society. But as Americans prayed that the Supreme Court would rule Obamacare unconstitutional, the Obama Administration decided to begin implementing it nowthrough Medicare. That way, even if the Supreme Court rules Obamacare unconstitutional, Medicare will do the housecleaning Obamacare, without modification, would not be able to do. Reid, Pelosi and then White House pit bull Rahm Emanuel (whose brother heads the Independent Payment Authority Board) wisely funded the National Coordinator for Health Information with $105,464,000,000.00 (that's billions) that was surreptitiously buried in Obamacarejust in case. I guess that's why Pelosi said, "Let's hurry up and enact this so we can see what's in it." But, what the American people wouldn't see in Obamcare was the Death Board, enacted a year earlier. Seniors were being told by their Medicare primary care physicians in January and February, 2012 to prepare for the fact that specific procedures and, in some cases, expensive lifesaving medications will no longer be available to them next year. In many cases seniors, who were trying to put off life-threatening procedures until they were absolutely essential since many of the operations were life threatening, began having those lifesaving procedures in 2012 instread of gambling on their being available to them in 2013. In some cases, it appears, seniors this eyar are being told the procedures they need are now suddenly not available because although they may been lifesaving, they are suddenly being viewed as "elective" surgeries because the patient, not the doctor, is requesting it. Today, due to questions of whether or not medical procedures on those 75 years of age or older are available to seniors who need them to prolong their lives are spreading like a wildfire in a drought, HHS Director Kathleen Sebelius insists that the "rumors" that the HHS will ration healthcare to the elderly is false. Yet, a large percentage of practicing physicians (many of whom plan to retire rather than participate in Obamacare) insist they have already been informed by the government that it will; and that when the government denies benefits, that patient may not be treated by any healthcare practitionerwhich is currently what happens in Canada. 1950s heart throb pop Singer Pat Boone, best known hits like "Love Letters in the Sand," and "Ain't That A Shame" is working closely with Jim Martin of 60 Plus Association fighting the implementation of Obamacare. In a recent TV commercial, Boone said "...the IPAB will operate in secret, and will have vast powers to reach into our lives, and will have the final, irrefutable say on Medicare policy," adding that the IPAB Board "...can ration care and deny certain Medicare treatments." The IPAB will decide "...whether you get care such as dialysis or cancer therapy.." or cardiac bypasses or angioplasty. Boone noted that the IPAB will make all of the health care decisions over 300 million Americans. Forget about getting to age 75. This exact thing happened to me this morning...here in Connecticut. I was scheduled for a cardiolite stress test. (This is a treadmill stress test where, during the process, they inject nuclear dye into your blood stream and then put you in a CTscan or something similar and take pictures of your heart...I have had three of these tests in the past 12 years due to blocked arteries discovered in 2000. They use the test to determine if I need a roto router or a bypass operation. So, I arrive at the hospital at 8 a.m. this morning. I'm in process of checking in at Cardiology and the lady says that my appointment has been canceled. She makes a call and speaks with someone and hands me the phone. It is a nurse in cardiology who says my medical coverage denied the procedure. I said it was a routine part of my heart maintenance, and it was ordered by my primary care physician, with the approval of my cardiologist who is the head of Cardiologywhich is right where I was standing. She says, "Yes, but we were denied our request." So, Henry said, "I have Medicare, so what is my back-up insurance doing denying anything?" Then the bombshell dropped. 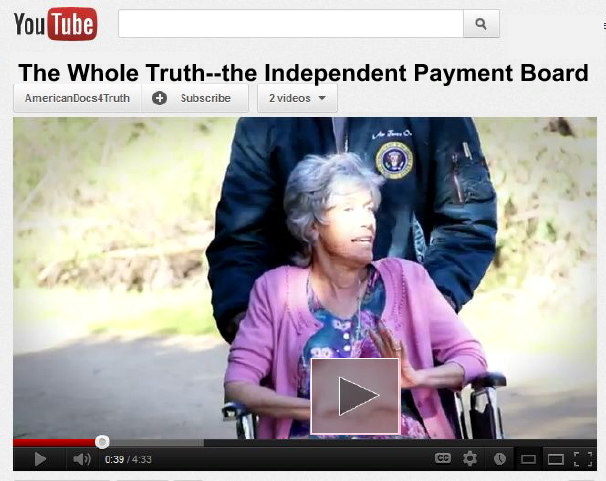 She said it was the Medicare Medical Board that denied the procedure. At that point I turned to everyone behind me and said, "Well, you won't have long to wait today because my stress test was just canceled by a Medicare Death Panel. I'm only 67, so you can imagine what's going to happen to us when we get really old." The entire waiting room and everyone there from patients to staff, just went dead silent. I said, "I guess I will have to write a letter to the [newspaper] and to my Congressman and Senators and let them know the Death Panels have already convened." Then I walked out. This Death Panel crap, Henry commented, has started. If we don't vote this guy and his criminal cronies out of office this November, then will all die younger than we should as broke paupers as this country goes bankrupt. Henry made comments about Dr. Suzanne Allen, head of Emergency Services at the Johnson City Medical Center in Johnson City, Tennessee that cannot be confirmed, and in fact were denied by Dr. Allen. That statement was his downfall. I became suspicious when, in Henry's letter, he commented that he had this experience in Danbury, Connecticut in the morning and sometime during the day he had what sounded like an eyeball-to-eyeball second meeting with emergency medicine physician Dr. Allen in Johnston City, Tennesseemaybe 12 to 15 hours away from Connecticut. That's a long hop to make in maybe a day. Because it didn't ring true, I knew it didn't happen as he reported it. I researched Dr. Allen who appeared very upset that someone would steal the use of her name. However, because there was some substance in what he said that is or may be affecting other people (even though his fabrication pretty much destroyed the credibility of his claim) I used parts of his fabrication as an illustration only because I have personal knowledge of instances with extended family members who have experienced, in part, what Henry claims he experienced. Early this year, two family members were told that "...within a few months Medicare will not pay for this procedure for you." The ramifications of stories about Medicare patients being denied tests and procedures their doctors felt were necessary to prolong their life are too serious to ignore even if those needed procedures are future events. Even discounting 85% of the rumors as exaggerations, there is still 15% that can't be ignored. Even 1% can't be ignoredparticularly if, within that 1% is a family member you love.